Gus planned this perfect adventure to paradise. On a chilly day after Christmas, Robert and Gus arrived at the Ranger Station in Everglades City to file a wilderness camping permit. 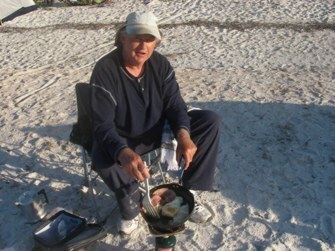 We picked Picnic Key for three of our four nights of camping the barrier islands that border the Gulf of Mexico along the northern edge of Everglades National Park. After spending Tuesday night at Collier-Seminole State Park we loaded up on breakfast and coffee and headed back to the Everglades City Rangers Station to load up our boats and head outbound to Picnic Key. We had a heavy tide pushing us outbound, so much so that we wondered if we could have paddled against the tide flow through some of the narrow channels if Gus had not scheduled our departure to take full advantage of the outbound tide. 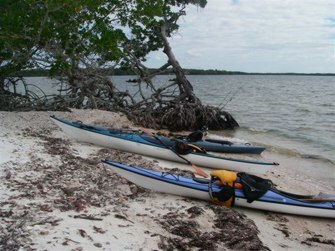 As we paddled out into the cloudy sky, the sun suddenly appeared and separated the sky in hemispheres – a cloudless and cloudy division with the cloud line retreating as we paddled out the six or so miles to Picnic Key and to set up our campsite. We explored a bit by kayak after setup, found lots of firewood when we returned and built a fire Mabel would have been proud of. That night was a bit chilly with no bugs at all. 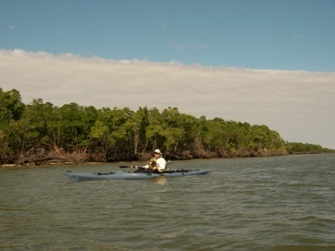 The next morning, Gus and Robert paddled back to the Everglades City Ranger Station to pick up Kerri as she was joining our little expedition. When we arrived at the Ranger Station Gus and Robert were surprised to see Kerri already there and waiting for us, as we hadn’t expected her for another hour. 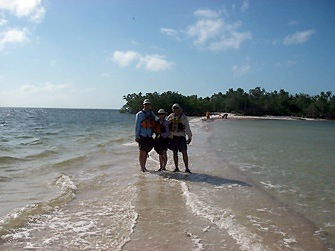 It was pleasant surprise as it meant we could ride more of the outgoing tide than we had calculated back to Picnic Key. We really made the most of the tides in our paddling and had only the wind to contend with on occasion. We had beautiful sunrises and gorgeous sunsets. Some nights we stood in awe at the beauty of the variety of colors that nature was providing. 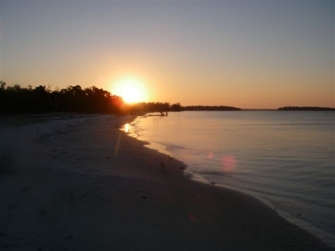 We all enjoyed camping on Picnic Key and Camp Lulu Island. 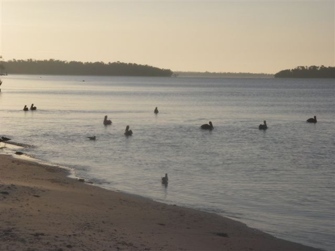 On Picnic Key each evening the pelicans would come in to feed at the shoreline just a few feet from where we camped. What a show these Pelicans put on! They seldom flew more than just a few feet before diving and catching another fish to swallow. The bugs and raccoons must have been on vacation! We were hardly bothered with noseums except a few minutes around sunrise and sunset and I don’t think we even saw a mosquito. This was the perfect time of year to make the trip. As a group, we visited the following keys: Whitehorse, Indian, Round, Panther, Tiger, Camp Lulu and some islands that didn’t seem to have names. Overall we all thought that the best way to see the islands was to camp in one location and do outbound day trips. 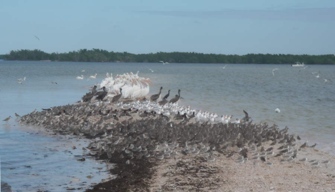 Our visit to Round Key was interesting as on the tip of the island we counted seven different species of birds crowding each other in distinctive and segregated groups on the sand spit that ran east from the end of the island. Indian Key was especially nice as a long sand spit extended out from the island almost a quarter of a mile. We met some very nice people from Charleston, SC who had come down to canoe around the park for a few days and had similar experiences as we did the night before. We bonded with them. This paddling trip was extraordinary. The weather could not have been better. The water was clean and clear. We spotted schools of fish and pods of dolphins everywhere. The variety of birds had us checking Gus’ Audubon guide daily to see if we could put a name to some of the more rare birds we had not seen often enough before to recognize. Did I mention that Gus cooked incredible meals that made our mouths water? Gus did a lot of fishing and covered some distance searching for the perfect fishing spot. 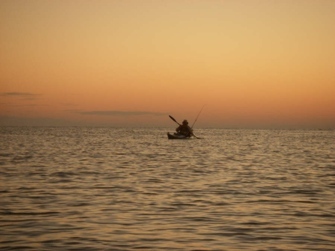 Watching Gus retuning just before sunset was a common site from his fishing expeditions. On our last night as a group camping, our neighbors (that we had coincidently met at Indian Island earlier in the day) shared some interesting refreshments with us. We were grateful! Since the hurricanes of 2005, there is an abundance of firewood everywhere, so we enjoyed fires each night. Some places to not miss: The tiny channel a few feet wide along the high and dry sand spit between Four Brothers and Hog Island (one of many Hog Islands in the chain), or the mangrove waterway pass across Panther Key that’s about midway along the length of the island, or the pass through the island that lies lengthwise between Panther Key and Camp Lulu Key. Gullivan Key was also special as was Whitehorse Key. It all left us amazed at the expansive beauty of the region. We saw at least two hundred islands on the trip. That left us with about 9800 islands to explore in the future. As we had paddled Indian Pass out from the Ranger Station initially we returned to the launch by taking West Pass back to Everglades City. Although there was plenty of water in West Pass during high tide (during low tide the pass looked problematic) the stiff east wind made the trip back more strenuous than the trip out. We all enjoyed this trip so much we hope it will turn into an annual trip. Notice: Reported conditions may change and there may be errors in this text. Apalachee Canoe and Kayak Club and author(s) of individual reports shall not be held liable for any omissions and inaccuracies contained herein. Readers are cautioned to supplement reports with other sources of information when planning a trip.